The early Jensen Interceptor MK1 (up to 1968) uses the Dunlop disc brake system popular in the late 1950’s and 60’s. In its day this technology was ground breaking but it now struggles to meet the demands of today’s roads and the raised expectation of today’s drivers. Jensen improved the brakes on the late MK1 cars by the addition of Girling calipers on the front and rear of the car. These brakes were carried over onto the MK11 cars. The Girling system represented a significant improvement in the stopping power of the Interceptor but the continued use of solid discs (all round) meant that long or repeated braking could still lead to brake fade. 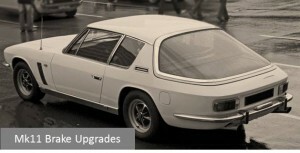 With the introduction of the MK111 cars Jensen finally fitted vented discs to the front and rear of the car. This improved the braking systems ability to dissipate heat and in doing so the stopping was further enhanced. Curiously, the diameter of the discs on the front of the MK111 cars is somewhat smaller then the earlier MK11. Possibly to allow the increased width of the vented disc to be accommodated behind the 15″ wheels. 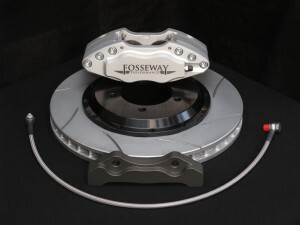 In response to the limited capabilities of the Jensen Interceptor brakes, Fosseway Performance has developed a number of Jensen Interceptor brake upgrade kits to allow you to enhance your cars braking abilities. Like all our products, they can be installed without permanent modification to the car and the calipers are carefully sized to ensure they remain compatible with the existing brake master cylinder and servo assembly. All kits are supplied with braided stainless steel brake lines. We can offer a full range of Interceptor brake upgrades. Please select the kit that best meets your needs from the list below. Please note that all the kits will fit behind the standard 15″ wheels with the exception of the forthcoming ‘Big Brake Kit’ for MK 11 and MK 111 cars which will require 17″ wheels.